Build: Well rounded medium-sized mix of both parents, who will grow up to be average in most aspects (speed, agility, strength, endurance) but will not particularly excel in any of them. Markings: Orange lightening bolt under left eye and down left side of neck. Wings start off as the blue that shades the rest of his body but end in a deep maroon and orange bands. Born to Ampere (x Gaucho) in Bridsong Year 5 (jan 15) along with my twin brother Zekle (Zero). 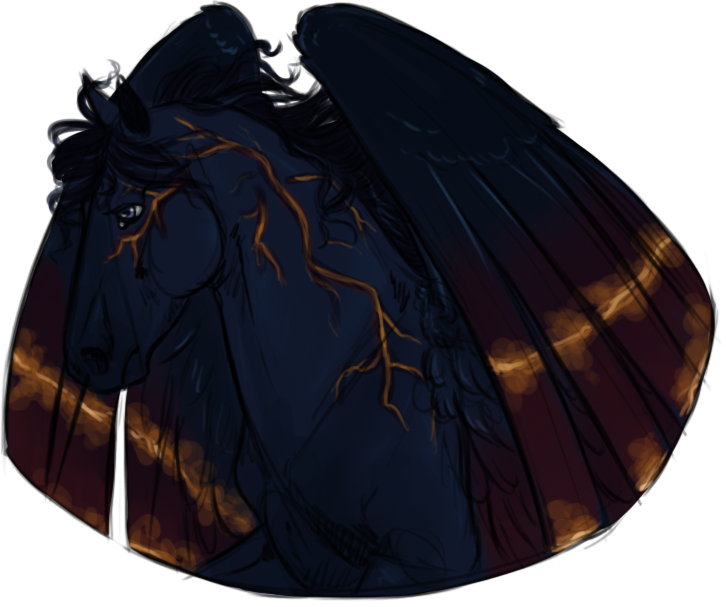 When I was laid a monster swooped in and took my egg away from my mother, Alija rescued me and raised me alongside her own children with the help of Bucephalus. Being as I wasn't born, I have no memory of Ampere or Gaucho and believe that my birth parents are Alija and Bucephalus. Email: Send Hertz an email. Please tag me in all posts!